For the time being, MetaTexis can import only TRADOS documents (or documents which have the same features as TRADOS documents). "The active document seems to be a TRADOS document. Its transformation into a MetaTexis document will probably be successful." "The active document is a MetaTexis document. No transformation needs to be performed." 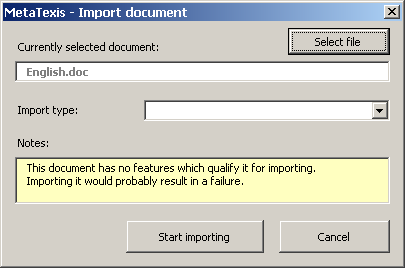 "This document has no features which qualify it for importing. Importing it would probably result in a failure." 2. If the document you want to import is not already loaded, click the Select file button and select the document you want to import. After the document has been loaded, MetaTexis will analyze the document to determine whether it qualifies for import. You will be informed about the features of the loaded document in the Notes text box (see step 1). 3. If the loaded document is not a MetaTexis document, you can select its type in the Import type drop-down box. If the loaded document does not qualify for importing, no import type is selected and the Notes text box displays a message informing you about this (see step 1). In this case, you are advised against importing the file. If the loaded document qualifies for importing, the import type is shown in the Import type drop-down box. 4. To import the file, click the Start importing button. A message will inform you about the state of the import process. You can stop the import process at any time by pressing Esc on the keyboard. 5. At the end of the import process, the start assistant will be shown (see Start Assistant).